/Calendar & Events /How Can a Mangoapps Admin Configure Calendar Setting from the Admin Portal? 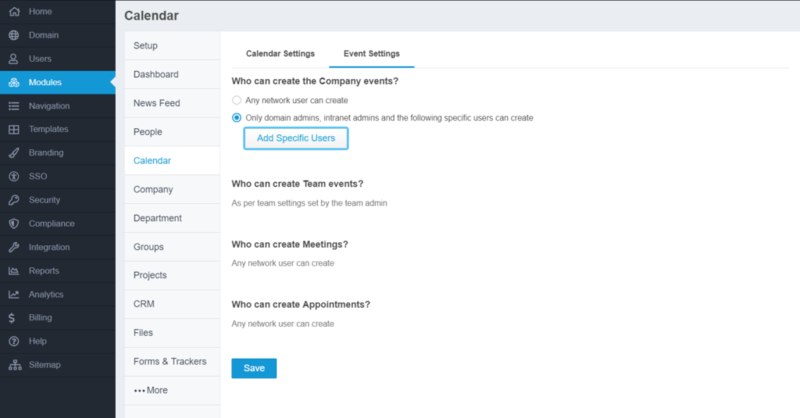 Events are a great way to setup a meeting, appointment, team event or a company event in MangoApps. All events appear on your calendar. Company events are events which are open to everyone in the company. Company all-hands meeting, a blood drive and rallying up volunteers for a cause are some use cases for company events. Company events automatically show up on everyone’s calendar. Company events can be made to automatically repeat/re-occur also. Domain admins control who can create company events. 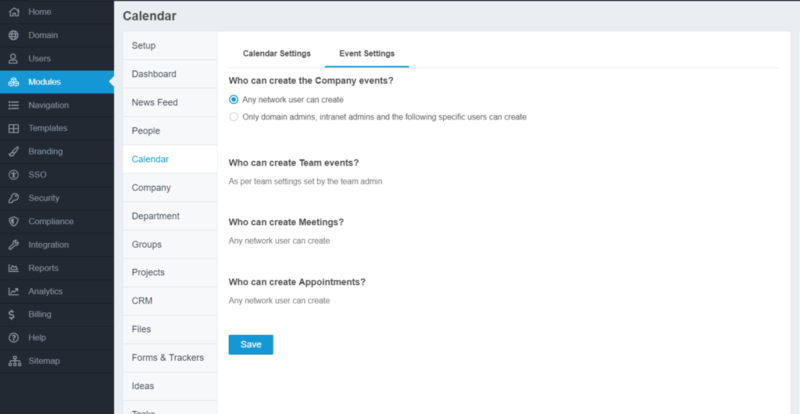 The network admin can configure who can create company wide events from the admin portal. Any network user can create – Any network user will be able to create company-wide events. This will send the notification to all the users who are the member of the portal. Only domain admins, intranet admins, and the following specific users can create – Only the user with domain admins, intranet admins permission or user selected from the list will be able to create the event. Team events are events that are for a specific project, group, department or opportunity members only. All attendees for this type of event belong to one team. A team discussion, group outing, department picnic, and project completion party are some use cases for team events. Team events automatically show up on the calendar of all team members. Team events can be made to automatically repeat/re-occur also. Team admins control who can create team events in their teams. Meetings are the way to schedule time with people in your company or outside your company to accomplish a goal. You can invite any number of people to a meeting. Meetings automatically show up on all the invitees calendar. Meetings can be created for recurring/repeating events also. Any network user can create a meeting. Appointments are activities that you schedule in your calendar that do not involve inviting other people. Anyone can create an appointment. Appointments only show up on the creator’s calendar. Appointments can be created for recurring/repeating activities also.